I admit I have a weakness for all things clear: clear shoes, clear bags, sheer shirts, and so it goes without saying, I was extremely excited when I found these peak toe boots from LaModa. The fact that these boots are clear makes them statement-making and you'll for sure have a lot of people checking your feet out as you wear them (with this is mind, I have to make sure that my toe nails were buffered and painted to perfection when rocking them). The fact that they have a block heel was a bonus because it meant that they are extremely comfortable to wear for long periods of time. Oh, and did I forget to mention that the block heel is filled with glitter?! - I love the glittler (the unicorn emoji would come in handy right about now), it makes them look so pretty! The sunglasses are a simple addition, but completely change up the whole outfit. In honor of Coachella and all the fabulous music festivals this summer, these sunglasses must be on your face, I know that they will be on mine for sure. These sunnies are completely on trend, mainly because Pantone the worlds colour authority selected the rose gold colour 'Rose Quartz' as 2016's colour of the year. 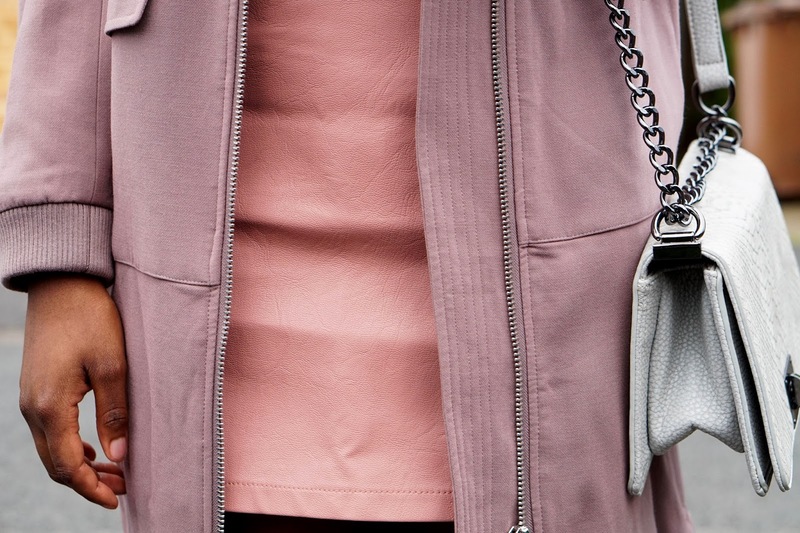 Okay, so onto this gorgeous pink skirt and longline bomber jacket. These are seriously going to be wardrobe staples this summer for me. The skirt is a lovely crisp colour and that feels amazing on. The A line shape is extremely flattering and emphasises your waistline because it is tight in that area. The quality of the skirt is really high, for the price especially makes this skirt worth clicking 'add to basket' on for. The longline bomber is awesome because it is a light layer that has a structured design and is uber chic at the same time. Lastly, we have my Croc and Chain Crossbody, which is part of the LaModa x Sarah Ashcroft collaboration. Sarah's blog That Pommie Girl is one of my go-to destinations for all things astyle inspo, so it goes without saying that I had to add this bag to my collection. This bag to me is reminiscent of the Chanel Boy bag; making this the high street version of a more affordable version. Although I dressed this up a little here, I think it'll also look great for a casual day look, along with simultaneously looking fab with an LBD for a night of cocktails. A real distinctive feature of the bag is the lipstick pockets inside the bag that are perfect for a night out because they will keep your lipsticks secure and will ensure that you won't lose them no matter how many cosmo's you go through. I've spotted a few other bits on LaModa's site that I will be adding to my collection soon for sure, seriously, this brand is absolute perfection and if you're looking to upgrade your bags,shoes and accessories then you muuuuuust check out LaModa. Woooow what a awesome Look ! YOU LOOOK SOOW GOOD. I LOVE UR SUNGLASSES!